Amritsar: The Punjab Police today announced arrest of two persons who were allegedly imprinting Referendum 2020 marks on walls in Amritsar. Like previous arrests in similar cases this time too the police has made huge claims of “thwarting a major campaign to disturb communal peace and harmony in the state”. According to an official statement Sukhraj Singh alias Raju and Malik Singh alias Meetu, were apprehended by the Amritsar police, who seized various materials used in making the banners/posters from Kot Mit Singh Canal and Sukhraj Singh’s house. The police have alleged that duo were being funded from overseas as part of the campaign started by Gurpartap Singh Pannu, Legal Advisor of Sikh for Justice, a New York based organisation. Duo have been booked under various sections of the IPC. 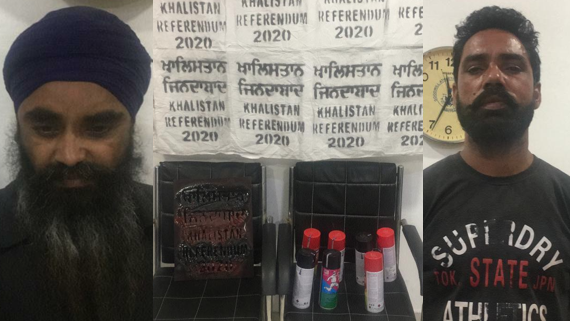 A police spokesperson said that information was received from reliable sources by Commissionerate Police Amritsar about the campaign being carried out to disseminate the message of Khalistan Referendum 2020 by putting up banners and posters in various places. A statement issued by the Information and Public Relations Department of the Punjab government states: “It was found that Sukhraj Singh, S/o Balwant Singh, hailing from Village Nagoke Distt. Tarn Taran and currently living in H. No. 205, Patti Behniwal Village Sultanwind Amritsar, was making the posters/banners at his home along with his associate, Malkit, s/o late Baljit Singh r/o Behniwal Village Sultanwind Amritsar. Further investigations revealed that they were receiving funds from someone settled abroad to create disturbance in the state by triggering tensions between two communities, said the police spokesperson”. Police says that a raid of Sukhraj Singh’s house led to the recovery of dye, banners, paint and cloth. The two men were arrested along with some more material from an under-construction bridge at Kot Mit Singh Canal where they were spotted affixing the banners. An FIR u/s 124-A, 153-A,153-B,120-B IPC PS Sultanwind Amritsar has bene registered and further investigations are in progress, police said.